Looking for an easy on-the-go option for lunch? 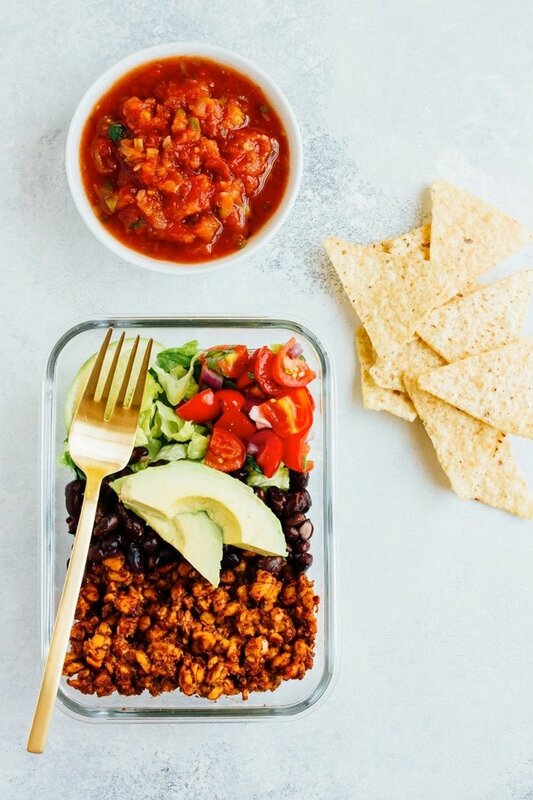 These tempeh taco salad meal prep bowls are perfect! The combo of protein-packed tempeh taco meat, black beans and veggies makes for a delicious and satisfying plant-based meal. Plus they’re vegan and gluten-free. 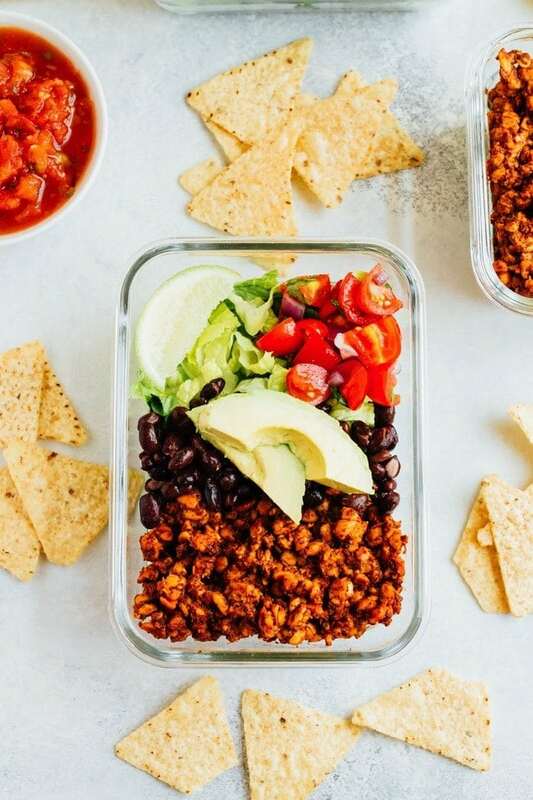 This tempeh taco salad recipe is a mash-up of two of my favorites — salads and meal prep bowls. Oh, and Mexican food, another fav of mine lately! 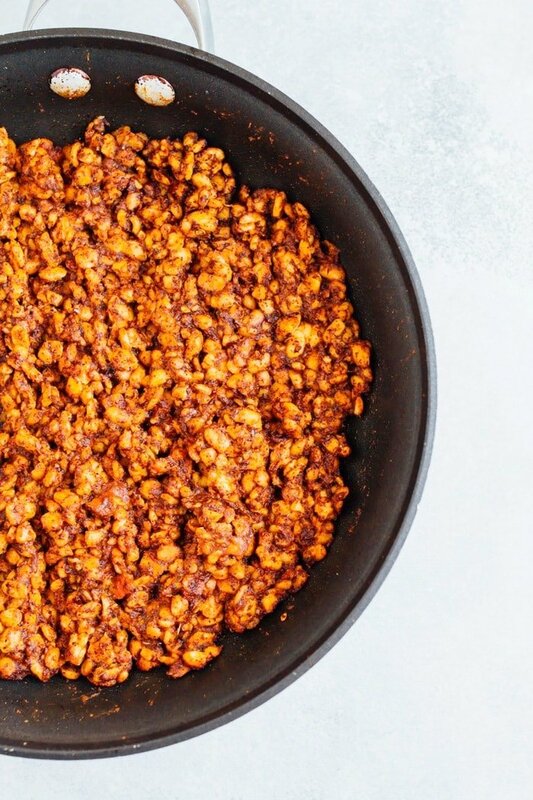 The real star of this recipe is the tempeh taco meat. Seriously though, I’ve been wanting to figure out a recipe for tempeh taco meat for ages. It finally came to fruition with this recipe and it’s super simple! 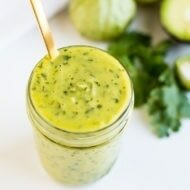 Just a little oil, homemade taco seasoning and tomato sauce and you’ve got yourself a flavorful plant-based protein option for all things Mexican — tacos, enchiladas, chalupas, salads or anything else that uses taco meat. If you’re new to cooking with tempeh, no worries. This recipe is a great place to start because it’s really easy. I’ve tried a ton of different tempeh varieties and Lightlife is definitely my favorite for a few reasons: it’s organic, gmo-free and easy to find a mainstream stores. I gravitate towards the Three Grain variety because it is the mildest in terms of taste, but I like the Original, Garden Veggie, Wild Rice and Flax too! 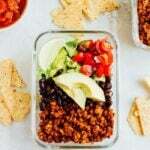 For this particular recipe I used the tempeh taco meat to create three meal prep bowls with crunchy romaine lettuce, black beans, tomatoes, onions, cilantro, lime, avocado and salsa. 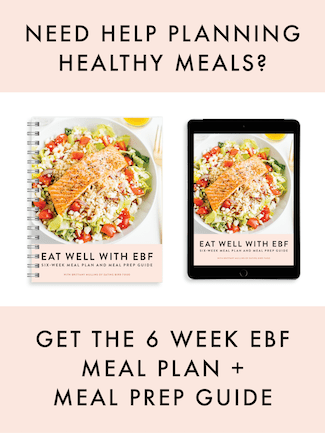 The bowls are easy to toss together as part of your weekly meal prep to have on hand for a weekday lunch or a quick dinner. Of course, you don’t have to turn this recipe into meal prep bowls — it works great as regular ol’ lunch/dinner recipe too. If you do pack the bowls for lunch be sure to bring a side container with salsa to use as your dressing. I also highly recommend bringing a handful of tortillas chips. They’re perfect for dipping into any extra salsa or as a crunchy topping for the salad. Just crush the chips up a bit and toss a few on the salad. If you’re feeling extra ambitious you can make a batch of my healthy guacamole to go along with the bowls as well! Enjoy! 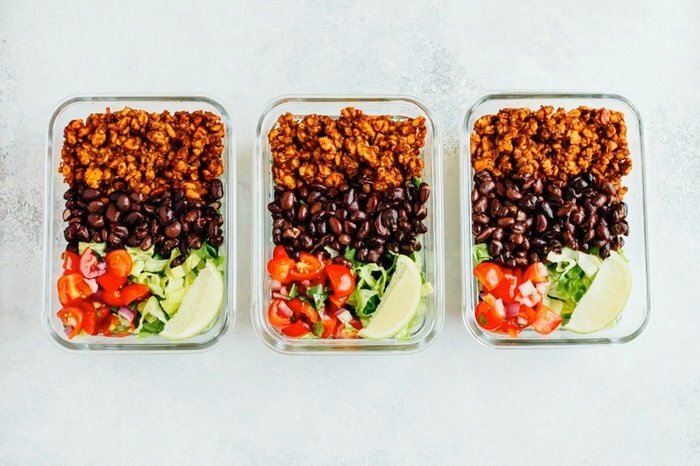 These tempeh taco salad meal prep bowls are an easy on-the-go option for lunch or quick dinner. The combo of protein-packed tempeh taco meat, black beans and veggies makes for a delicious and satisfying plant-based meal. Vegan and gluten-free. 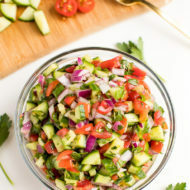 Serve salad bowls with fresh salsa and hot sauce as the dressing and tortillas chips on the side. This looks great! 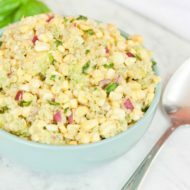 I’ve always been interested in trying tempeh and this recipe looks like a great recipe to try out. Yum! Love taco salads but always looking for a tasty vegetarian alternative. This looks amazing! This looks delicious! I love that it’s vegetarian too. 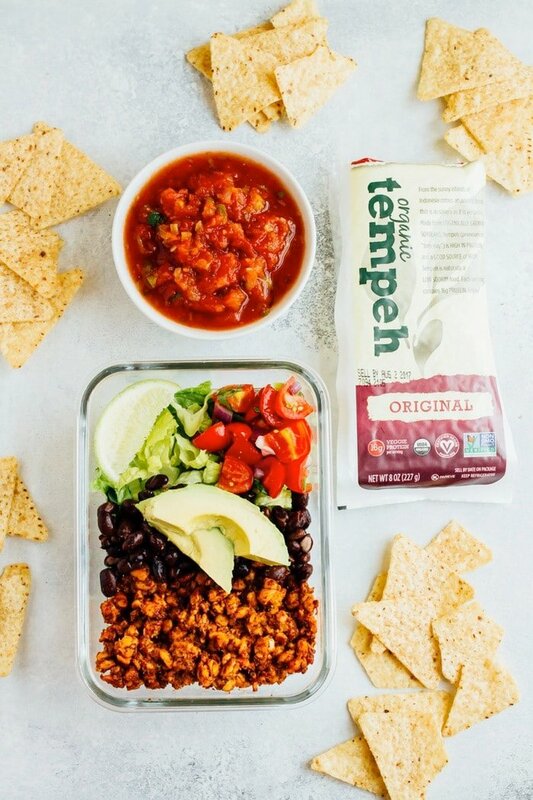 This looks great, I love taco salads, but had never thought to use tempeh before. Thanks for the recipe. Gluten-free and dairy-free… Exactly what the doctor ordered. Vegetarian alternative is even better!! You have given us a true winner. Do you suggest eating the meal cold then?? Or taking out the salad while heating up the beans and tempeh?? Looks so good! How long will these last? Also do you eat it cold? They should last at least 3-4 days in an air-tight container in the fridge. I normally eat it cold but it’s totally up to you!